Posted: May 3rd, 2009 under Hamradio. Below you can see the sample of the beautiful K5D QSLdesign. It is designed by SQ8X. He was one of the operators at the recent VK9LA expedition. If you take a look at his page here, you can see that he has also designed cards for VK9DWX, ZS8T, ZD9BCB, VP6TD and several others. Stan is working as a freelancer: website and DTP designer, press- and radiojournalist and a professional photographer. Recently he is also involved in international movie productions taking place in Poland. I really like his designs and wish I could do the same, but I need more practice, though I did have a shot at my latest QSL which can be seen here. 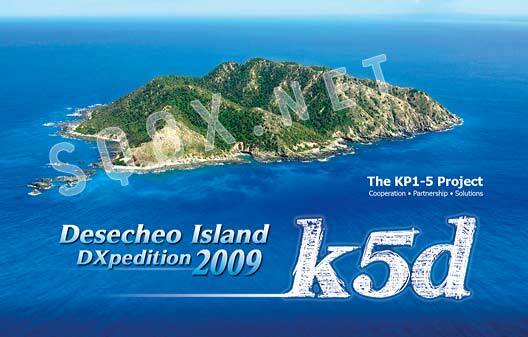 You can ask Stan to design a card for you if you are planning to go to a rare IOTA or DXCC. Stan has also done several hamradio websites like VK9LA.info, 3Y0E.com and ZS8T.net. The last 2 sites aren’t up and running anymore. Any word yet when the cards will be sent out? I think they are being sent out now. I think some people started receiving them around the time I posted this.